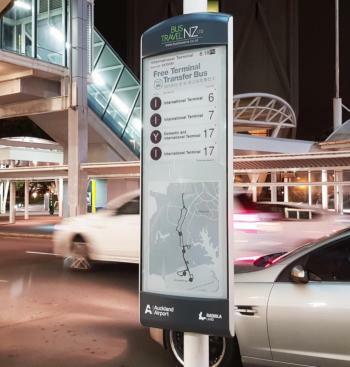 Visionect and Radiola Land have installed E Ink signage at Auckland Airport's public transport terminal. Each sign includes two 13.3" E Ink screens to provide Real Time Passenger Information (RTPI) to commuters. The signs display important travel information, bus locations and marketing messages.